Theme Overview: Emerging Countries: Converging or Diverging Economies? Russia’s importance in world agricultural markets has grown substantially during the 2000s, on both the demand and supply sides. The two main developments are that agricultural imports have surged and the country has become a large grain exporter. From 2000 to 2008, Russia’s agricultural imports grew from $7 billion to $33 billion, making the country the second largest agricultural importer among emerging markets, after China (Figure 1). The main imports are meats, processed foods, fruits, and vegetables. On the export side, over 2001–08, Russia’s net annual grain exports have averaged 9 million metric tons (mmt; Table 1). In marketing year 2008/09, Russia is predicted to export 20 mmt of grain (net), and Russia, Ukraine, and Kazakhstan collectively about 48 mmt of grain onto the world market (FAS). Russia’s status as a big meat importer and grain exporter is a reversal of its agricultural production and trade during the Soviet period when Russia, and the Soviet Union as a whole, was a heavy producer of meats and large importer of grains and oilseeds (Table 1). During the 1980s, the Soviet Union imported an average of 34 mmt of grain per year. The region’s switch from annual grain importer of 34 mmt to grain exporter of 48 mmt in 2008/09 is a huge shift of over 80 mmt toward increased supply of grain on the world market. This article examines why these large demand and supply shifts in Russia’s agricultural trade have occurred, and the near- to mid-term outlook for trade. Russia’s transition from a planned to a market economy that began in the early 1990s fundamentally altered the volumes and commodity composition of its agricultural production and trade. The changes appear to be an economically justifiable restructuring consistent with the country’s underlying cost and price competitiveness, or comparative advantage, across major agricultural commodities, especially meat versus grain. Around 1970, the Soviet government decided to expand the livestock sector, the main motive being to improve consumers’ standard of living by increasing meat and dairy consumption. Using large budget subsidies to both livestock producers and consumers along with controlled prices and trade, the regime succeeded in raising meat production by over 60% between 1970 and 1990 (Liefert, 2001). Because the Soviet Union could not produce enough animal feed to support its growing livestock herds, it became a large importer of feed grain, soybeans, and soybean meal, to the benefit of U.S. bulk crop producers. The move to a market economy in the 1990s reversed the expansion of the livestock sector during the earlier planned period. Because of budget stringency, the huge government support to agriculture, and especially the livestock sector which received the bulk of subsidies, was largely eliminated. Also, integration into world markets revealed that Russia was a high cost producer of livestock goods, making it difficult to compete with lower priced imports. Put in other words, the country had a large comparative disadvantage in the livestock sector (Liefert, 2002). Output of meat plunged, falling from 10.1 mmt in 1990 to 4.4 mmt in 2000 (Table 1). Meat imports in turn began to rise, though imports of not only meat but all agricultural goods fell sharply during Russia’s economic crisis in the late 1990s (Table 1 and Figure 1). Another reason Russian agricultural imports began to increase during the 1990s was because the country’s consumers were exposed to the array of world food products, as well as other consumer goods, they had been denied during the planned period. Russian consumers in particular became interested in foreign-produced processed foods. The contraction of the livestock sector during transition is also a key reason why Russia has become a major grain exporter in the 2000s. Rather than importing grain, soybeans, and soybean meal to feed a large livestock sector, Russia now is importing more meat and other livestock products and exporting grain. The decrease in Russia’s need for animal feed has been so great that the country has been able to move from big grain importer during the Soviet time to exporter in this decade despite a large drop in grain production over the two periods. Russian average annual grain output during 2001–08 was 83 mmt, down from 103 mmt over 1987–90 (Rosstat). Although Russia’s meat imports began to rise during the 1990s, from 2000 to 2008 they increased by a substantial 78% in volume (FAS). 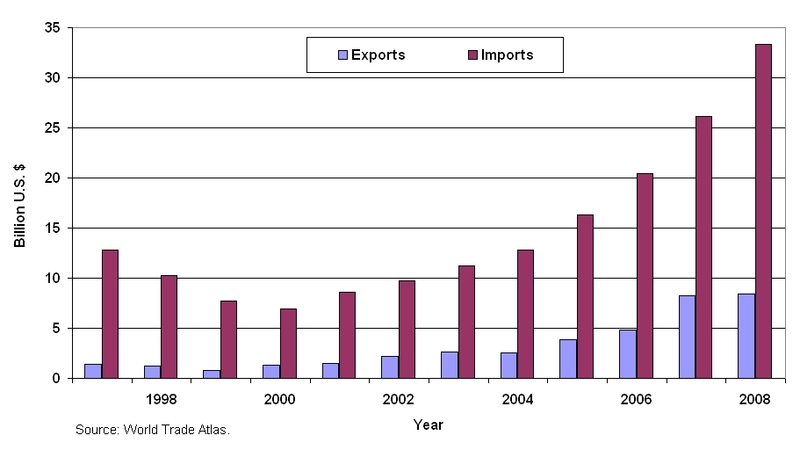 The meat import growth was part of a boom in the country’s total agricultural imports during the 2000s. There were two main macroeconomic causes of the import surge. The first was high Russian Gross Domestic Product (GDP) growth, which averaged 7% a year over 2000–08. Rising GDP boosted consumer income and food demand, benefiting both domestic producers and foreign suppliers. For example, from 2000 to 2007 Russian per capita meat consumption rose from 41 to 56 kilograms (Rosstat). The second cause of growing agricultural imports was an improvement in the price competitiveness of imports vis-à-vis Russian-produced goods. During the 2000s, Russia’s nominal market exchange rate used to buy and sell rubles has not changed much against the U.S. dollar, euro, and other major currencies. However, price inflation has been much higher in Russia than in the United States, European Union (EU), and many other countries that export to it. Over 2001–07, Russia’s inflation averaged 13–14% a year, resulting in total inflation during the period of about 140% (Rosstat). Over this time, overall inflation in the United States was only 20%, and in the EU 15%. The greater inflation in Russia compared to its major trading partners made Russian-produced goods more expensive compared to imported products, such that Russians switched to buying more imports. The real exchange rate of the ruble captures these relationships, as it equals the nominal exchange rate adjusted for Russia’s level of inflation relative to that of its trading partners. Using this measure of the exchange rate, the ruble appreciated against the dollar in real terms by over 100% between 2000 and 2007, and against the euro by over 50% (ERS). 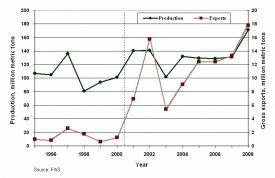 The economic crisis that hit Russia in autumn 2008 reversed the two macroeconomic developments that had been driving agricultural import growth, thereby also reversing the import rise. Because of the crisis, Russian GDP will almost certainly fall in 2009, and maybe also in 2010. In April 2009, the macroeconomic consulting firm Global Insight forecast that 2009 GDP would decline 3.8%. Yet, if the economy stabilizes within a year or two, as Global Insight and other major forecasters predict, GDP could begin to grow again at 4–5% a year. The crisis also has caused the ruble to depreciate substantially, in both nominal and real terms, mainly because of capital outflows. From mid-July 2008 to mid-April 2009, the ruble nominally depreciated against the U.S. dollar by 30%, with the ruble/dollar exchange rate rising from 23.3 to 33.5. Yet, if both the Russian and overall world economy begin to grow again within one to two years, the ruble should resume its real appreciation. During the 2000s, Russia had large total trade surpluses. For example, in 2005 Russia’s trade surplus of $118 billion equaled 15% of its GDP (Global Insight). The bulk of the country’s export earnings come from oil and natural gas. Renewed world growth is expected to put upward pressure on energy prices, such that Russia would probably continue to run trade surpluses. This in turn would strengthen the ruble. Given that every year in the 2000s, Russia had inflation of 9% or higher, one can expect that over 2009–12 the country will experience annual inflation of at least 6–10%. In April 2009, Global Insight forecast Russian average annual inflation over this time of 11%. Higher inflation in Russia compared to that in its main trading partners will cause the ruble to continue to appreciate in real terms (as during 2000–07), or in other words, will reduce the prices of imports relative to domestic production. The return of Russian GDP growth and ruble real appreciation also should bring a return of agricultural import growth, though probably at a lower rate than in the past eight years. One reason the import growth is expected to be lower is because GDP growth and ruble real appreciation will be at reduced rates compared to past years. Another reason will be the high investment in Russian agriculture and the food industry in the past few years. From 2004 to 2007, investment in the two activities rose in real terms by about 275% and 175%, respectively, for reasons discussed in the next section (Rosstat). The increased domestic output from this investment will mitigate future agricultural import growth. As discussed earlier, a major reason Russia has become a grain exporter in the 2000s is because the contraction of the livestock sector during transition substantially reduced domestic demand for feed grain. Another reason is that, after falling during the 1990s, Russian grain production in the 2000s began to rise. The factors that explain why grain output has grown in the decade do not include a rise in grain production area. Average annual Russian grain area over 2001–08 was 45 million hectares, a drop from 50 million hectares over 1996–2000, and a large fall from 65 million hectares over 1987–90 (Rosstat). In Russia, Ukraine, and Kazakhstan together, average annual grain area during 2001–08 was down by 30% compared to 1987–90. Most of the reduced grain area was not lost to other crops, but rather became fallow. The rise in world agricultural and food prices in 2006–08 sparked interest in returning the idled grain area in this region to production, which could substantially increase world grain supplies. This would put downward pressure on world prices, mitigating any future price jumps and benefiting the consuming poor of the world. During Russia’s grain price surge of 2006–08, area did respond to some degree, rising over the period by about 5% (Rosstat). Yet, in Soviet times, the regime pushed grain area throughout the country on to marginal land, resulting in much inefficient high cost production. In order for grain area now to rebound substantially, world prices probably would have to rise again considerably, and remain high. Also, Russia would have to invest heavily in improving the physical and commercial infrastructure for storing, transporting and loading grain at ports for export. 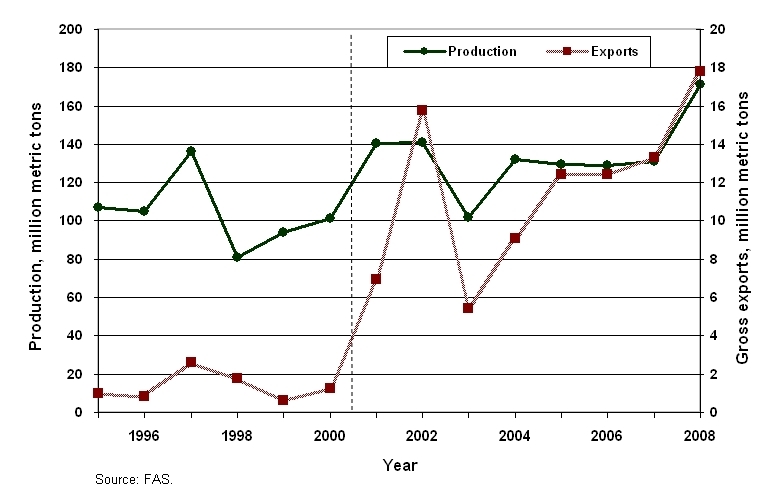 Given that grain area fell in the 2000s, the reason Russian production rose is because of growth in yields. Russia’s average annual grain yield over 2001–08 was 1.83 tons per hectare, compared to 1.30 over 1996–2000 (Rosstat). The dominant type of grain producing farm in Russia continues to be the inefficient former state and collective farm of the Soviet period. Although most of these farms have been officially reorganized during transition as joint stock companies, they remain largely unreformed (Brock et al., 2008). However, a likely major reason for the growth in grain yields, as well as an overall increase in the productivity of resource use in the grain sector, is the rise during the 2000s of new agricultural “operators.” These are large vertically integrated enterprises that bring investment, new technology, and superior managerial practices into the sector (Serova, 2007). The new operators are especially attracted to grain production, because of the profitable export opportunities. The new operators represent best current production practice in Russian agriculture, and continued growth in Russian grain yields, production, and exports depends largely on whether they keep expanding in numbers and influence. However, another reason Russian grain yields and production have risen during the 2000s is favorable weather. The continental climate of Russia and other former Soviet Union countries results in volatile weather conditions for grain production, especially rainfall. Figure 2 gives Russian annual grain output and exports over 1995–2008. Grain output was low every year over 1995–2000 except for a big upward spike in 1997. On the other hand, grain production over 2001–08 was high every year except for a plunge in 2003. The weather indicators show that in every year during the second half of the 1990s, Russia had unfavorable weather for grain, except for 1997, while in every year during the 2000s, it has had relatively good weather, except for 2003. Also, the surge in grain output in 2008 coincided with highly favorable weather. 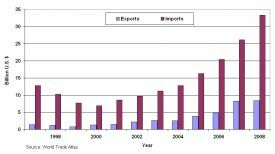 How Has Russian Policy Affected Agricultural Trade? Russian policy during the 2000s has resisted, rather than promoted, the country’s move toward importing livestock products and exporting grain. In 2003, the Russian government established restrictive tariff rate quotas (TRQs) for imports of beef and pork, and a pure quota for poultry, converted in 2006 to a TRQ. In January 2009, the low tariff-rate quotas for pork and poultry were lowered further and the out-of-quota tariffs raised, to 75% and 95%, respectively. During the 2000s, Russia also has imposed many sanitary-based restrictions, and often complete bans, on imports of meat (especially poultry) and other livestock products. In 2005, the Russian government identified agriculture as a national priority area that would receive increased funding along with health, education, and housing. From 2005 to 2007, state support to agriculture from the federal and regional governments together rose 87% in nominal rubles and 52% in real (inflation-adjusted) rubles (Rosstat). According to the government, the main objective of agricultural policy is to revive the livestock sector, which is getting the bulk of the new agricultural subsidies. Russian support to, and trade protection for, livestock producers could continue to increase. In January 2009, the Russian government established a state grain company. The officially identified functions of the “United Grain Company” are to increase the state’s involvement in the domestic grain market, increase grain exports, and improve the physical infrastructure for the grain sector. However, the nature and full objectives of this company are not yet clear. Might one of its purposes be to use the grain sector to further the expansion of the domestic livestock sector, say by restricting grain exports at times of low harvests and high prices? A potential constraint on future Russian agricultural policy is accession to the World Trade Organization (WTO). Russia officially began its WTO accession bid in the mid-1990s. By early 2009, it had concluded bilateral negotiations with most WTO members, including the United States and EU. In the two key areas of import tariffs and domestic support, Russia in its accession negotiations has been asking for bound commitments above the existing levels (a bound tariff or support amount is a maximum allowable level in the future). Russia’s current average agricultural import tariff is about 18%, up from 10% in 2000. However, Russia is negotiating for bound agricultural tariffs above actual applied tariffs. On domestic support, Russia is asking for annual bound support of $9.5 billion, which compares to its 2007 actual support level of $5.7 billion (Russia and World Trade Organization; Rosstat). If Russia soon joins the WTO, its negotiated bound levels of tariffs and support might be above the current levels. Accession on such terms would not liberalize Russian agricultural trade and support policies, and thereby not increase imports. Yet, the United States and other foreign suppliers would benefit because the bound levels would provide a cap on any future rise in tariffs and support. Russia’s agricultural trading partners might gain the most from Russia’s WTO accession by having an official forum for challenging the country’s sanitary and phyto-sanitary import restrictions. During the 2000s, Russia has become a big agricultural importer, especially of meat and processed foods, and a major grain exporter. Even more so, Russia, Ukraine, and Kazakhstan together are now a very large grain exporting region. Russian policy statements and actions during the 2000s show stronger interest in reviving the livestock sector than in exploiting the country’s potential as a grain exporter, and especially reveal dissatisfaction with large meat imports. Policies therefore could expand to curb agricultural imports, particularly of meat. Such policies would resist the economic forces driving Russia’s growing role in world agricultural markets. Brock, G., M.Grazhdaninova, Z. Lerman, and V. Uzun (2008). “Technical efficiency in Russian agriculture.” In Russia’s agriculture in transition, pp. 353–372, edited by Z. Lerman. Lanham, MD: Lexington Books. Economic Research Service (ERS), U.S. Dept. of Agriculture. ERS International Macroeconomic Data, Real Annual Country Exchange Rates. Available online: http://www.ers.usda.gov/data/exchangerates/Data/RealAnnualCountryExchangeRates.xls. Foreign Agricultural Service (FAS), U.S. Dept. of Agriculture. FAS Production, Supply and Distribution Online. Available online: http://www.fas.usda.gov/psdonline/. Global Insight. Country Reports, Russia (subscription service). Liefert, W. (2001). Agricultural reform: major commodity restructuring but little institutional change. In Russia’s uncertain economic future, pp. 253–81, edited by J. Hardt. U.S. Congress, Joint Economic Committee. Available online: http://econ.la.psu.edu/~bickes/jecrussia.pdf. Liefert, W. (2002). Comparative (dis? )advantage in Russian agriculture. American Journal of Agricultural Economics, 84(3), 762–67. Russia and World Trade Organization website. Available online: http://www.wto.ru. Russian State Statistical Service (Rosstat). Rossiiskii Statisicheskii Ezhegodnik (Russian Statistical Yearbook). Moscow, annual. Serova, E. (2007). Vertical integration in Russian agriculture. In Global supply chains, standards and the poor: How the globalization of food systems and standards affects rural development and poverty, pp. 188–206, edited by J. Swinnen. Wallingford, England: CAB International. Wehrheim, P., K. Frohberg, E. Serova, and J. von Braun. (2000). Russia’s agro-food sector: Towards truly functioning markets. Dordrecht, Netherlands: Kluwer Academic Publishers. World Trade Atlas, Global Trade Information Services (subscription service). Note: Grain numbers are average July-June marketing year values for the period identified at the left. Meat numbers are for calendar year identified at the right. Trade values in parentheses are net imports, without parentheses net exports. William Liefert (wliefert@ers.usda.gov) and Olga Liefert (oliefert@ers.usda.gov) are economists with the Market and Trade Economics Division of the Economic Research Service, USDA. Eugenia Serova (eugenia.serova@fao.org) is Senior Adviser to the Director of the Investment Centre Division of the Food and Agriculture Organization. The views expressed are the authors' alone and do not in any way represent the official views or policies of USDA or FAO.